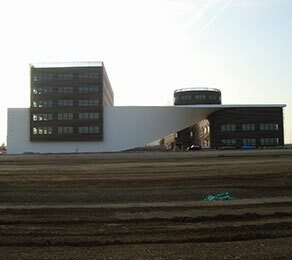 This contemporary structure actually consists of two separate buildings that are connected by a ‘sail’ of white concrete. The twisting shape, blending vertical and horizontal aspects, is used to symbolise the propeller of a plane, which also reflects the aeronautical connections of the site and its environs. The area is a major centre for the aerospace industry and is home to the headquarters of Airbus. The combined area of both buildings is 10,500 m2, and the development is designed to accommodate 700 people. The buildings have been designed to be ecologically sustainable in compliance with the environmental requirements of the UDZ, and incorporate features that control water and energy consumption and the management of waste. CCL Systems were used to post-tension the curved wall that is the main feature of the development. This provided a means of strengthening the structure whilst still maintaining its complex shape. The wall at a length of 56 m and a height of 12.1 m, contains 530 cubic metres of concrete. In order to minimise the thickness of this elegent shape, post-tensioning was used and the overall thickness of the wall was reduced by 0.55 m.
CCL XM20 anchorages were used on the project and post-tensioning was completed to a very tight schedule. The project was undertaken by CARI sud-ouest on behalf of SCCV Les Alexandrins. Cari appointed PCB to carry out the post-tensioning works.